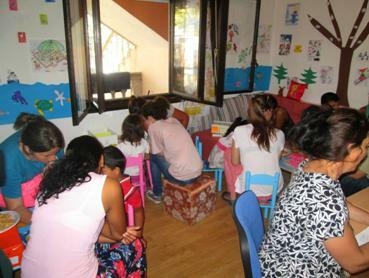 In July and August 2014, a family literacy programme (FLP) called Literacy Cubed, developed in a European partnership project implemented by five organizations – RWCT International Consortium and Asociatia Learn&Vision (Romania), the Institute of Education (UK), Orava Association for Democratic Education (Slovakia) and the Pedagogical Center of Montenegro – is being piloted in Roma communities in Cluj-Napoca, Dolny Kubin and Podgorica on 48 children and 72 adults. According to UNESCO, the term ‘family literacy’ refers to practices within families as well as to intergenerational learning that promotes the development of literacy and related life skills. Literacy Cubed (LIT3) supports the reading and health literacy skills development of three generations: primary school children (aged 6-11), their parents/ carers and their grandparents. While providing opportunities for shared, meaningful literacy activities for families, LIT3 aims to equip the adults included in the program with the skills and practices to support the development of their children’s literacy skills, and to raise awareness that adults in the family are the children’s first teachers. LIT3 sessions include activities structured as follows: “read to”, “read with”, reader response to text, family word bank, literacy games, health literacy, as well as warm-up activities, reflection and assessment of learning. The goal of LIT3 is to raise the attainment level of Roma children in general education. The implementation of the 48-hour programme engages volunteers recruited from the three local communities to assist in the family literacy workshops, and reading buddies – successful secondary school Roma students – who serve as role models for the younger children. 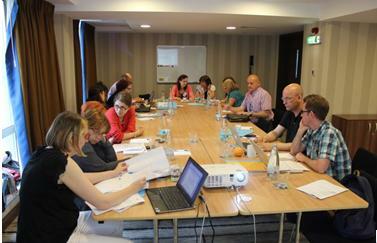 Project partners planning the family literacy programme implementation, Cluj-Napoca, Romania, June 2014. As this is a pilot programme, the partnership is carrying out research to carefully document outcomes and impact. Further in this 2-year project, based on the findings of the research, a policy paper will be produced and shared with European and local decision-makers, and local strategies to raise literacy levels in Roma communities will be developed with the engagement of the local stakeholders’ working groups. Literacy Cubed – Focus on Roma Families is funded with support from the European Commission (Project number 543068-LLP-1-2013-1-RO-KA1-KA1MPR). For further information about the project, see www.lit3-project.eu or contact office@rwctic.org.